When I heard that Michel Rolland was hired as a consultant for Château Figeac, I thought, like others, that it was a premature April Fool’s Day joke. Eric d’Aramon has not exactly been a great fan of the Rolland style. And yet, here we are, as you can read in my news brief published today (29 March 2013) on decanter.com. Although no immediate comment was made from the château other than the confirmation, Michel Rolland told me over the phone that he had been approached by Marie-France Manoncourt, the widow of former and longstanding owner Thierry Manoncourt. Eric d’Aramon is the son-in-law who has been leading the winemaking for some 20 years now. 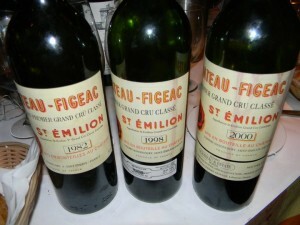 Mr. Rolland said that he intends to bring Figeac to the level of a Premier Grand Cru Classé A, to join the prestigious company of Cheval Blanc, Ausone, Angélus and Pavie – the latter two had been promoted in 2012, the last time that the Saint Emilion classification was revised (every 10 years, the classification is reassessed). A trio of Château Figeac from a dinner in Washington D.C.
Château Figeac did not get a promotion. 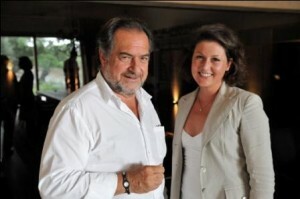 Michel Rolland consults at Ausone, Angélus and Pavie. First off, I am a fan of freshness in wine: I like some al dente in my red Bordeaux. Especially when alcohol levels for Merlot can reach 15 degrees. Acidity is needed, vivacity and tension. Second, I have met Mr. Rolland on various occasions and emphatically say that he is not the evil man that he was made out to be in the movie Mondovino, for example. Or from cartoon books, like the one below. Michel Rolland has a style. Picking relatively late, when the grapes are ripe, he would say. And he has. Often. Here for example an article I wrote that Decanter Magazine had published a few years back, contrasting his style with what people would call “more traditional”: my article is still relevant today, as we see how the wine forums are full of debate as to what Mr. Rolland’s influence will be on Château Figeac. 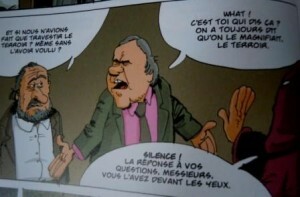 Michel Rolland has his fans, especially Robert Parker. And he is very talented. He has an excellent reputation for blending for example. And he is in demand worldwide, with scores of clients from South Africa to France. The picture below (credit to the Monteverro estate) shows him at Monteverro, which he consults. I reviewed some of those wines here. While some welcome the new role that Mr. Rolland will play at Château Figeac, others are (very) upset, such as eminent wine critic John Gilman. Without making any premature judgments – because we have not had a chance to try Figeac under Mr. Rolland’s guidance – count me as a fan of the wines that have been made under the direction of Eric d’Aramon. I like their freshness, aromatic qualities, drinkability. You can read my notes from a dinner I had organized in Washington D.C. featuring 11 vintages from the estate HERE. Which brings me to the point that I do share some of the worry that fans of Figeac have when they see Michel Rolland coming to town. Hardly always (take for example the excellent wines of Château Léoville Poyferré, under Rolland’s consultancy), but wines by Michel Rolland tend to convey a certain “glossiness” that comes across as more New World in style, with concomitant higher alcohol levels (coming often from later harvesting) and vintage variation is thus lessened. That is not to say that a Château Bon Pasteur 2005 (Bon Pasteur is a wine that Michel Rolland owns) will taste exactly like a Bon Pasteur 2006… I am a fan of Bon Pasteur. For example, the 1998 is an excellent wine. But Mr. Rolland’s winemaking certainly brings out more “richness” overall, and can sometimes trump the expression of terroir, which, of course, includes climate in the definition. I know that fans of Michel Rolland will disagree, even vehemently, and that is their prerogative. I speak only for my taste. I noticed the difference clearly in a vertical at Latour Martillac in the northern Graves region last summer with owner Tristan Kressmann. The reds under Mr. Rolland, until he left after 2005, had a glossier (and larger-scaled) aspect when compared to the ones after he had left. Since the 2006 vintage, Denis Dubourdieu has been consulting. Compare also for example Vieux Chateau Certan with Pavie, and I think you can understand what I mean. Both come from exceptional terroirs – different certainly – but the grape make-up is not dissimilar. The Pavie will communicate its extraction more readily, and will tend to convey more heat, while the VCC will convey greater freshness and come across as more elegant. Same story when one would compare Haut Bailly with Pape Clement. In the end, it comes down to taste. Both Pavie and VCC are estates that take pride in their methods and reflect the hard work invested in making the wines. What was it that John Kolasa of Château Canon in St Emilion – I am a fan of his style to be sure – once said to me? I’m not sure I buy Kolasa’s “it’s only wine” line, because it’s damn expensive wine! By the way, as a Bdx fan I thought you might like to post on a board like the Bordeaux Wine Enthusiasts; all Bdx all the time! This story found it’s way onto that board more than a week ago, and as expected, it’s been the source of some controversy. Thanks Mike, will do! Yes, Château Canon has also reached stratosphere pricing like too many other Bordeaux. Agreed! But his general observation was that we engage sometimes in too many polemics. Let’s see what happens. High quality wine is a long term thing. I think Figeac is one if the most misunderstood wines in Bordeaux for a variety of reasons that beguiles a linear narrative. It is hard to compare the Manoncourt wines with d’Aramon’s repetoire as none of the later’s wines are fully mature, but I do believe that a lot of what Mssr. d’Aramon was in the spirit of Thierry’s history of stellar wines (64, 75, 82 come to mind). I find this to be very sad news as I’m in the camp that believes all things Rolland/Parkerised will lead to inferior wines at age 30+ which is where Figeac truly shines. Only time will tell, but I hope Mssr. Rolland’s consulting/intervention is minimal and is not geared towards creating wines that are more pleasing upfront but lack the substance and magic on the back end. Thanks Faryan for your thoughtful post. We had a great time tasting wines that Eric d’Aramon had brought to the US last January (2012). I can see why Figeac fans are concerned… Let’s see what happens as this story unfolds. Definitely a fantastic website with informative posts, I surely will bookmark your site. Have an awesome day!